Agrale, previously called AGRISA, is a Brazilian manufacturer of military vehicles, commercial vehicles, engines and agricultural tractors. It is based in Caxias do Sul, in the state of Rio Grande do Sul. Established in 1962, the brand's current model line-up consists of the Marrua SUV and pick-up truck. Tractors include both self-developed models, and ones based on Zetor designs. Agrale no longer produces motorcycles or scooters. Agrale subsidiary Lintec produces generators, diesel water pumps, engines, rotary cutters (weed wackers) and materials handling equipment. The company was originally called AGRISA, and built AGRISA-Bungartz tractors under license of the German-based Bungartz company. Later alliances included Deutz-Fahr, when they built some tractors and trucks under the Agrale-Deutz name, and later with Zetor. AGRALE is now a part of the Francisco Stedile Group, which includes the Lavrale, Fazenda Três Rios, Germani Foods and Yanmar-Agritech Tractors companies. The most traditional segment of activity Agrale is the manufacture of small tractors with power from 14.7 hp, intended mainly for use in the vineyards of the wine region of Rio Grande do Sul, near the company headquarters. Today the tractors are offered with power ratings up to 140 hp and offers up to 9.2 tonne trucks, diesel stationary and bus chassis, a segment in which it is acting with more emphasis. 400 Series - The first tractors were produced by Agrale models 415, 416 and 420. The 420 model 4100 gave rise to the following series, being produced until the present day with several changes, mostly cosmetic. 4000 Series - The 4000 series was composed by the models 4100, 4200 and 4300. Currently, the 4100 remains in production with models 4118, 4230, 4240, featuring versions 4X2, 4X4 and industrial, the latter with optional engine Natural Gas. Also part of the line, tractors load model derived from 4230.4 (4x4 version of the model 4230). BX6150 - equipped with, turbocharged MWM TD229 EC6, 103 kW (140 hp) 6-cylinder engine. BX6180 - equipped with a turbocharged MWM TD229 EC6, 126 kW (168 hp) 6-cylinder engine. Series BX - produced from the 1990s and led to the current 5000 and 6000. Agrale now offers a competent security and comfort, therefore, developed a wide range of chassis and Rear Engine Advanced, low-floor (low entry) or semi-low which ensures greater accessibility for people with reduced mobility. Through its subsidiary Lintec, also in Caxias do Sul, Agrale manufactures engines and power equipment (water pumps, lawn mowers and generators), with wide range of power. Lintec also sells Ruggerini and Lombardini engines alongside its own Agrale brand (790 m, m795w, etc. ), water or air cooled, and Lintec (LD 1500, LD 2500, etc.) water cooled. Agrale also assembled International trucks, a brand acquired by NC2 Group brand. Agrale currently assembles heavy and light Internationals, a partnership that began in 1998 trucks and ended in 2013 with 43,000 units produced, which was mounted the first truck International 4700 brand. Agrale manufactured over 400,000 motorcycles from 1984 and 1987. The models were: Agrale SXT, SST, Elefant, Dakar, Explorer, and Elefantre. 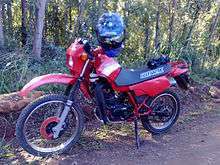 Agrale motorcycles were based on Cagiva models. ↑ "Archived copy". Archived from the original on 2007-07-29. Retrieved 2010-08-31. Wikimedia Commons has media related to Agrale vehicles.